Is FreeNationalLotto a Scam or Legit? Read Reviews! I’m scratching my head trying to decide whether I should jump into FreeNationalLotto.com. This is a cute little free – yes folks free – daily lottery. Oh, and they have a bi-weekly lottery also. What’s holding me back is usually these kinds of free lotteries mean you’re going to get spammed by promotions and advertising. I made the mistake once of getting into one of these and I’m still dealing daily cleanups in my inbox. There are two games at FreeNationalLotto.com. The daily one is drawn at noon each day (GMT) and involves selecting 5 numbers from 1 to 40. The draw is based only on the sets of numbers actually chosen so yes, there is a guaranteed winner. We’re not talking big money here as the draw starts at £5 and rolls up £5 each day it is not claimed. Players have to visit the site daily to see if they’ve won. The FNL 5 Ball Draw takes place Thursdays and Sundays at 20:00 (GMT), starts at £250 and rolls up £10 each time it isn’t won. The odds of winning are harder here as it’s based on any combination of the 1 to 40 numbers. Daily prizes have to be claimed within 24 hours or the draw rolls over. The highest it has gotten is £40. It looks like the bi-weekly prizes also have to be claimed within 24 hours. Payments of winnings are through PayPal. I’m guessing that’s one of their advertisers. There is a link on their site to register if you don’t have an account. 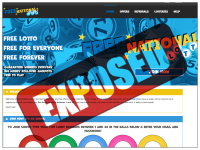 FreeNationalLotto.com is funded by advertising and promotion companies. You agree to receive stuff when you register. This isn’t licensed gambling so they are not registered with any gambling commission. The weird thing is there is nothing on their website that is advertising. They do say they will send you a reminder each day to check your numbers so I guess maybe that’s where the advertising might come in. There are a couple of ways to earn bonus balls. Each day you visit the site, you get one bonus ball which equals 1p (GBP). If you refer someone to the site and they register, you get two bonus balls. You can also earn bonus balls participating in promotions they send you. You can’t do anything with this – at this point – except if you win a daily or bi-weekly draw, whatever has accrued will be added to your winnings. Who Can Play at FreeNationalLotto.com? Players have to be 18 years age or older and can only register once. They say anyone can play – it doesn’t matter where you reside. Who Is Free National Lotto? FreeNationalLotto.com is owned by Lotto Media Ltd., a company registered in England with a head office in Norwich. There is an online form, email address and a heap of social media links to contact them. There are no phone numbers or live chat. Would you mind rating FreeNationalLotto.com? Part of me wants to register and go for this and part of me is holding back. Nothing is free and Free National Lotto says upfront that they fund this by sending you advertising and promotions. Heck, you can earn bonus balls by participating in promotions they send you. The other thing I wonder about is having to go in and check whether I’ve won every day. I’d kick myself if I won and then hadn’t claimed my prize. The site does get a thumb’s up for its honesty and being so straightforward. I think I’m going to take a shot and go for this one. I’m just wondering how much of this stuff I’m going to receive.